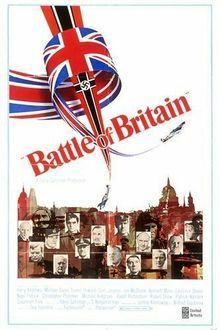 Battle of Britain american movie poster. In 1940, the British Royal Air Force fights a desperate battle vs. the Nazi Germany Air Force for control of British air space to prevent a Nazi invasion of Britain. Three airworthy Hurricanes were used during the production of the film: MkIIc PZ865/G-AMAU, MkIIc LF363 and MkXII 5377/G-AWLW. 2 further Hurricanes MkI (P2617) and Sea Hurricane MkIb (Z7015) where not airworthy but used as taxiing examples. Hurricane MkIIc (LF751) was acquired by the production team and was used as a mould for the replica Hurricanes to dress the set and did not itself appear in the film. These non flying replicas included some that where fitted with motorcycle engines and able to taxi. All airframes where modified to resemble a Hurricane MkI as this is the correct variant for the Battle of France/Battle of Britain era. Reg. G-AMAU Hawker Hurricane Mk IIc s/n PZ865 painted as Air Chief Marshal Sir Park’s personal Hurricane OK-1. This aircraft is currently operated by the Battle of Britain Memorial Flight. Hawker Hurricane Mk IIc PZ865/G-AMAU. Hawker Hurricane Mk IIc LF363 taxiing with fictional registration H3422 and squadron code. This aircraft is also currently operated by the Battle of Britain Memorial Flight. Hawker Hurricane MkXII 5377/G-AWLW with fictional registration H3418. This aircraft was operated by the Canadian Warplane Heritage Museum, until 1993 when it was destroyed in a hanger fire. Twelve airworthy Spitfires where used in the production of the film, along with seven taxiing examples and seven used as static aircraft to dress the set. A number of full scale replicas where used as static and taxiing aircraft. Scale models were also used in the dogfights with the Stukas and scenes where Spitfires where destroyed in the air or on impacting the ground. Real airframes if required were modified to resemble early MkI or II Spitfires that flew in the Battle of Britain this required modifications to the rudder and wingtips, with tear drop canopies of later variants being removed replaced with a modified fuselage and a period canopy arrangement. However many features of the later variants could not be completely corrected these aircraft can be identified by under wing radiator arrangements the length of the aircrafts nose and cowling shape of RR Griffon engined variants, retractable tail wheel and other features. Below is a collection of aircraft that could be identified from the film footage. Supermarine Spitfire MkIIa P7350 seen in the left of this shot bearing fictional squadron codes CD-H.This aircraft is also currently operated by the Battle of Britain Memorial Flight. The aircraft entered service in August 1940 and during the Battle of Britain served with 266 and 603 Squadrons. Supermarine Spitfire HF MkIXb HM434. Spannish production under licence of german bomber Heinkel He 111. Built by CASA and re-powered after war with Rolls-Royce engines. Two CASA 352L were used in the production of the film to represent Luftwaffe Ju 52s of which the CASA 352 was a post-war Spanish copy built under licence . The aircraft were loaned from the Spanish Air Force and painted in Luftwaffe livery, the CASA 352L is the only real aircraft in the film not to use Rolls Royce Merlin or Griffon engines. Despite the D variant reached the front line unit only at the end of 1941, some radio controled model could be seen; for example when one of them crashed into a radar tower. Seventeen airworthy Hispano Aviación HA-1112s were used in the production of the film with sixteen being the HA-1112-M1L variant and a single two seat HA-1112-M4L variant. Five aircrafts were used as taxing examples and three static aircrafts for dressing the set, number of full scale replicas where produced for this purpose too. The Aviación HA-1112 is a Spanish built RR Merlin powered variant of the Bf 109 used by the Luftwaffe in the Battle of Britain, these aircrafts differ from the variant used in the battle and where modified to resemble Bf 109 Es. A number of modifications where made: False machines guns added to the engine cowling, rounded wing tips removed and false tailplane braces added as well as a Luftwaffe livery. Although it is not clear whether the two seat variant can be seen in the film, a section of footage is shown filmed from the rear seat of this aircraft. A dogfight filmed from within Hispano Aviación HA-1112-M4L C4K-112/G-AWHC. HA-1112-M1Ls engauge a Spitfire, filmed from within Hispano Aviación HA-1112-M4L C4K-112/G-AWHC. HA-1112-M1L engauges a Spitfire, filmed from within Hispano Aviación HA-1112-M4L C4K-112/G-AWHC. This page was last modified on 16 October 2017, at 06:48.